Sheffield veterans Adrian Flanagan and Dean Honer of The Moonlandingz and Eccentronic Research Council team up with singer Leonore Wheatley of The Soundcarriers to deliver beautifully clean, nostalgically old-school keyboard funk disco pop. Their ten consistently great tracks do what exactly it says on the tin, with After Dark, The Age of the Train and The Ballad of Remedy Nilsson among the standouts, and there's even a fun, bouncy, Kraftwerky German language version of Pink Floyd's Another Brick In The Wall. Joyous. Out on Desolate Spools. 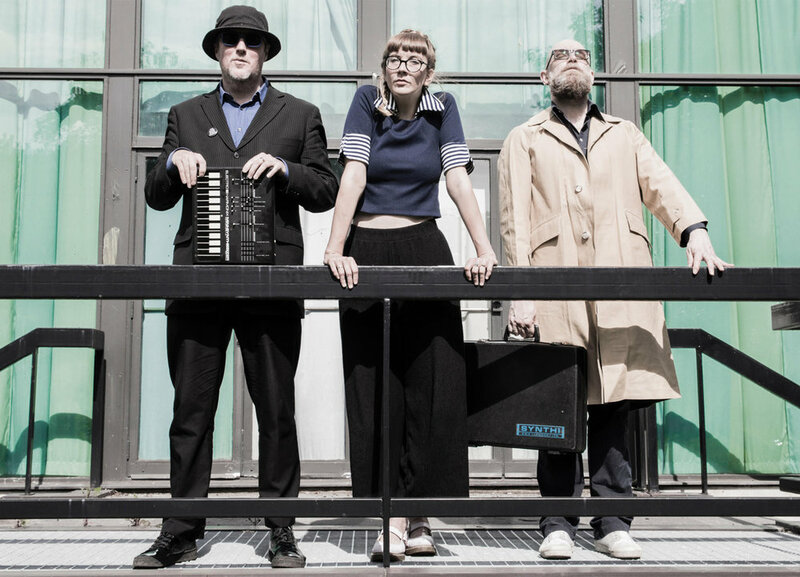 Elder Island are the Bristol-based trio of singer and cellist Katy Sargent, bassist Luke Thornton and guitarist and synth wizard David Havard. This is fun, fascinating, eclectic stuff, a mixture of soulful pop, dance and oddball electronica. They have a certain eccentric, humorous charm, Sargent's style reminiscent of Róisín Murphy, and delight in old equipment, as you might imagine. Standout tracks also include Don't Lose. Out on their own label, Elder Island. It's a wonderful concept of out-there eclecticism, one of the most interesting bands of the 90s taking on Gentry's 1968 masterpiece album, with a series of guest singers who are all variously original in their own right. But can Bobbie's work be really improved, or is this a form of Gentry-fication? The result is a mixed bag. There are decent performances from Margo Price (Sermon), Susanne Sundfør (Tobacco Road), Beth Orton (Courtyard) and Hope Sandoval (Big Boss Man). Parchman Farm with Carice Van Outen has some beautiful instrumentation, and there's an interesting appearance by Vashti Bunyan on Penduli Pendulum. The voices of Phoebe Bridgers (Jessye’ Lisabeth) and Marissa Nadler (Refractions) have a thin, ghostliness. And the jewel in the crown, Ode To Billie Joe falls to Lucinda Williams, but while she can sing, it somehow lacks the nuance and subtletly of the original, to which hopefully this release will encourage listeners to return. Out on Bella Union. A niche release from the American band, this is a selection of lo-fi live recorded versions from the famous New York studio of several of their biggest sounds including American Dream, as well as covers of Chic’s I Want Your Love and the Heaven 17 song (We Don’t Need This) Fascist Groove Thang. More of a fans' collector item, but quality stuff nevertheless. Out on Columbia. LCD Soundsystem - Emotional Haircut (Electric Lady session). The trio of Tim Hellman (Oh Sees), Justin Sullivan, and Will Ivy continue on from their previous Castle Face-released LP with six more songs in and EP of high-quality, skilful angry noise recorded in Ty Segall's home. See them live and feel your clothes vibrate (bring ear plugs) but they remain of a fabulous force of unstoppable indie. Out on God? Records. Beautiful faraway simplicity by the Los Angeles singer-songwriter with an album that sounds like it was recorded in a sunny meadow in the 1960s. You can almost see the butterflies and taste the apples. Perhaps her voice is sometimes a little too childlike and over-echoey and reverby, but as a follow-up to her breakthrough, 2015’s On Your Own Love Again, this is another exquisite collection of sensitive, sensual music. Out on City Slang. Christine Carol Newby, the performance artist, musician, and writer, who of course worked with Throbbing Gristle releases her first solo album since 1982's Time To Tell, with eight soundscape recordings that reflect her art and life. It's pretty niche stuff, mixing jazz and electronica, but oddly absorbing. Out on CTI. Not only is this the Lemonheads’ tenth album, but also their first record in 10 years since Varshons (the first), Varshons 2 another unusual choice of covers including Yo La Tengo, Nick Cave, The Bevis Frond, NRBQ, The Eagles, Paul Westerberg, The Jayhawks, Lucinda Williams and John Prine. Evan Dando is on fine, hollering form, though perhaps it is also high time he also released some new material. Out on Fire Records.